Congrats to the Dublin Ladies senior football team on their 2-14 to 1-6 win over Kerry in round 1 of the Division 1 national league. It was great to see Amy Ring on the starting 15 â and also scoring 2 points from play. Amy Connolly, Niamh Collins and Niamh Ryan were brought on during the game and made significant contributions and will surely be pushing for a starting 15 spot next week when they take on Mayo in round 2. Well done to Lisa Davies and Jodi Egan who were selected for the Dublin U16 panel for 2016. Well done also to Sarah OâLeary and Aisling OâKelly who were selected for the Dublin U14 panel for 2016. The Gaelic 4 Mothers team is making their international debut in Brussels on Saturday 27th February when they play Craobh Rua, Belgium ladies GAA club. The squad of twelve players have been training hard at Loreto every Tuesday night to be fit and ready for the upcoming match. Even the temptations of Belgium chocolate won't distract these determined mums, at least until the match is over! Best of luck to our U16 team who play St. Anneâs in the 2015 U16 division 4 final next Sunday at 3 p.m. in Boharnabrenna. Itâd be great to see as many supporters as possible at the game. Congrats to minor players Tarah OâSullivan and Afric Whelan who both played significant roles for Colaiste ÃosagÃ¡in when they won the Leinster Championship last Tuesday (January 19th). All club members wish them the best of luck in their quest for the All-Ireland title. Best of luck to all club players who will be sitting their mock exams in the coming weeks. A reminder to members that club membership is now open and a 15% discount is being offered to those who pay before January 31st. Click here to process your registration, or from the club website, click on the Registration menu item on the left hand side and choose your plan and the payment options. For members who may be experiencing financial difficulties please contact our club registrar Niall O'Kelly at niallok59@gmail.com and your registration will be processed mindful of your circumstances. Best of luck to all club players who will be involved with their counties in the Ladies National Football League which starts next weekend. Congratulations to Tarah O'Sullivan and Hannah O'Neill who have been named on the Dublin Minor panel for 2016. Both Tarah and Hannah were members of last year's Dublin Minor Panel so their names are already on our County Reps page. Tarah has also been given the honour of captaining the team this year. Best of luck girls!! You may recall that we launched our club on line registration facility during 2015 and this makes it easier for us to manage our Club and helps us to communicate more effectively with you, our members. It also offers the Club a number of much needed opportunities to raise additional funding. Members who pay their membership online before Jan. 31st will benefit from a 15% reduction in annual fees, as passed at the recent AGM. Registration is open now and will close on April 30th. Please ensure your registration is completed by then. In accordance with previous years, for a registration to be valid, payment must be received. For members who may be experiencing financial difficulties please contact our club registrar Niall O'Kelly at niallok59@gmail.com and your registration will be processed mindful of your circumstances. Click here to process your registration, or from the Club website click on the REGISTRATION menu item on the left hand side and choose your plan and the payment options. This is a completely safe and secure online payment and registration system, used by over 900 Clubs across the country. In choosing your membership options, we would also encourage adults to become members either through family membership or as individual adults. Becoming a member entitles you to vote at the AGM, grows our membership numbers for the purposes of obtaining grant funding, provides much needed additional funding to the Club and most of all grows the Foxrock Cabinteely GAA Club family. A Fundamentals coaching course will be held in the Man O War GAA club, Co Dublin on Saturday the 20th of February from 10am to 4pm. This is the first step on the coaching pathway course participants must be 16 years or over. A Level One coaching course will take place in Fingallians GAA club, Swords on the 27th of February (Day 1) and on the 9th of April (Day 2) from 10am to 4pm. This course is developed to challenge existing coaches to look more in depth at coaching principles and practices. Coaches will apply information to solve coaching scenarios in practical situations. Course participants must be over 18 years and hold a FUNdamentals course Certificate. (Note GAA Foundation cert is not applicable). The level one course consists of two 6-hour contact days. All participants must complete a logbook between day 1 and day 2 with participants completing both days of the course in order to obtain their certification. If any members are interested in attending either of these courses, please contact Glynn Davies (Header of Player and Coaching Development) at football@foxcabgaa.ie to register your interest. The club extends its condolences to club players Caroline and Emma Dawson and their parents, John and Anne, on the death of Anne's mother Miriam Brassil earlier this week. May she Rest In Peace. The executive of Foxrock Cabinteely GAA club would like to wish all our players, mentors and members a Happy New Year and would like to thank EVERYONE who made 2015 such a successful year for the club. We look forward to 2016 and building on the successes of last year. In line with Club Policy, Foxrock Cabinteely GAA Club wishes to invite applications for the following Team Manager or Lead mentor positions for 2016. Manager positions apply from Senior down to U13. Lead mentor applies from Nursery to U12 as it is non-competitive. If you wish to apply for any of the above positions, or re-apply for an existing team position, please download the "2016 Team Manager Application Form" - which is available in the âDownloadsâ section of our web site; or click here to download it - and return it, via email, to secretary@foxcabgaa.ie no later than 6 p.m. Wednesday January 13th. NOTE: If you are applying for a position on more than 1 team, a separate application form MUST be submitted for each team you wish to be part of. A reminder to all teams that Kilbogget is still closed for the winter break and is currently scheduled to re-open the weekend of January 16th / 17th. If the bad weather continues, it is likely that this date may move out. Mentors will be informed should this be the case. Seapoint will be available in early February for training on Tuesday and Thursday's only and original time slots will be kept. Team managers are asked to inform Gordon Bell when they return training so we can keep track of usage. 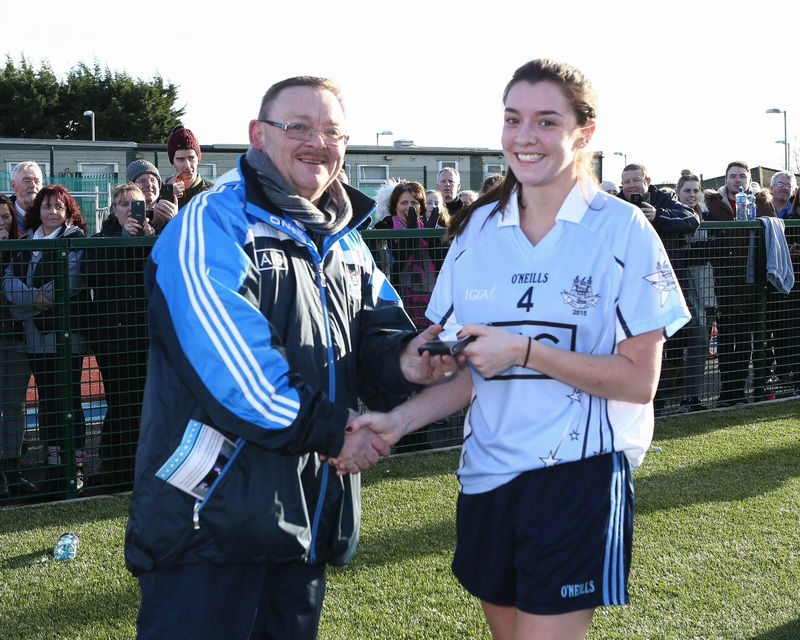 The club had a huge number of representatives at the recent DubStars games on January 3rd. Ciara Mac Kenna was selected for the Junior game and turned in a terrific performance in the full back line. For the senior game, a remarkable 7 players were selected. The âmagnificent sevenâ were: Sinead Goldrick, Niamh Ryan, Fiona Claffey, Amy Ring, Niamh Collins, Hannah Noonan and Ciara Crotty. 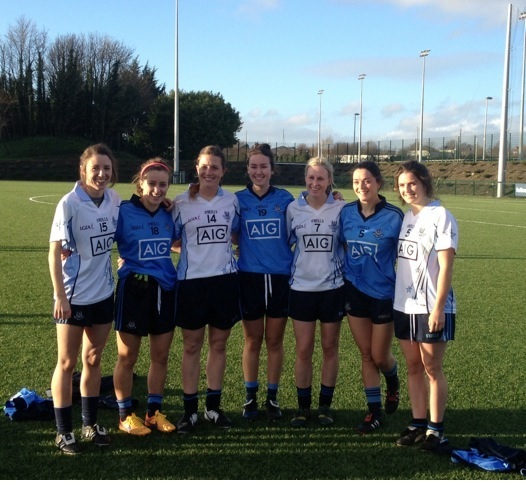 Sinead, Niamh Ryan, Fiona and Amy all scored in the game and Niamh Collins had the honour of captaining the DubStars team. Congrats to all!